The Sportuli Sacroiliac Support Belt is recommended for anyone who is susceptible to lower back pain, especially if you are involved in a job that requires repeated lifting, bending or twisting. It will help to prevent the connective tissues around the joint from being strained, stretched too far or torn. Sportuli double diamond-shaped elastic bands are symmetrically distributed on both sides of pelvic bones, and four elastic bands are pressed on the lower back from four directions respectively. This works to slightly compress the pelvic bones, strengthening the connective tissues that hold the sacroiliac joint together. All products from Sportuli are covered by our 100% satisfaction guarantee against faulty workmanship or materials. Click "Add to Cart" to get the recovery with total confidence. 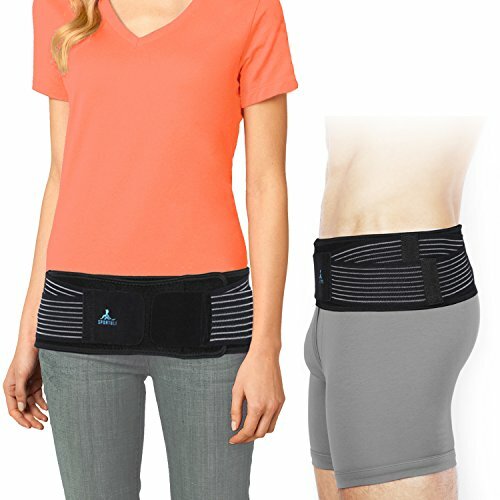 STABILIZE YOUR SACROILIAC JOINT: 4.5" wider sacroiliac si joint belt provides gentle stabilization for the sacrum, pelvis and lower back, reduces and prevents pain that contributes to lower back and sciatica. DIAMOND-SHAPED PRESSURE DESIGN: Sportuli SI brace features a unique double diamond-shaped pressure design to adjust diamond pressure bands up and down according to the size of your sacrum to get more stable and more fitted. Belt conforms to the natural contours of the pelvis, especially important for women. Perfect for daily use like working, sleeping, exercising and people who stand for long periods of time. BALANCED COMPRESSION: Four elastic bands are pressed on the lower back from four directions respectively to keep the belt in place and provide non-slip support, which allows you to customize the amount of additional support needed, adds comfortable stability to the sacroiliac joint. EASY TO USE: Low-profile and wraparound design give you the freedom to wear invisibly all day/night under or over clothing, hook and loop fasteners for easy application for women and men. SPORTULI 100% SATISFIED GUARANTEE: Covered by our 12-month guarantee against faulty workmanship or materials, purchase with confidence. If you have any questions about this product by Sportuli, contact us by completing and submitting the form below. If you are looking for a specif part number, please include it with your message. Si Belt - Sacroiliac Belt - Large - Hip Size 42" - 52"